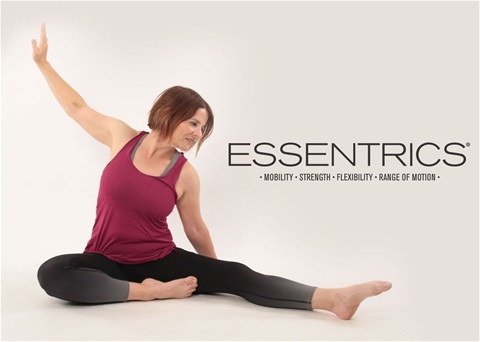 ESSENTRICS is a full body workout that rapidly changes the shape of your body through a dynamic combination of strengthening and stretching. ESSENTRICS is based on the concept of eccentric training which stretches the muscles then strengthens them in the elongated position. The result: strong and flexible muscles with immediate changes to your posture. This is a program that enables your body to move fluidly and effortlessly in your daily life and all your activities; ESSENTRICS offers a fundamental level of true fitness. With a diverse music playlist accompanying each routine, this equipment free workout leaves you feeling energized, positive and healthy. Essentrics training will increase strength and flexibility, improve posture, rebalance and tone the entire body, provide pain relief, improve body alignment, speed recovery from injuries and improve sport and athletic performance. What can someone expect from a class? In an Essentrics class, participants will experience a challenging, high energy, low impact workout in a supportive environment. Through dynamic full body movements set to great music, every muscle of the body will be stretched and strengthened. You will feel pleasantly worked out and energized! Classes are done barefoot. A yoga mat and water bottle are all you need!